The National Assembly Building occupies the central position on National Assembly Square in downtown Sofia, Bulgaria. The first passenger terminal at Sofia Airport opened in 1939 with an expected future capacity of 600,000 annual travelers. Two views of the Varna City Theatre building, one in the 1930's and the other in 2010. 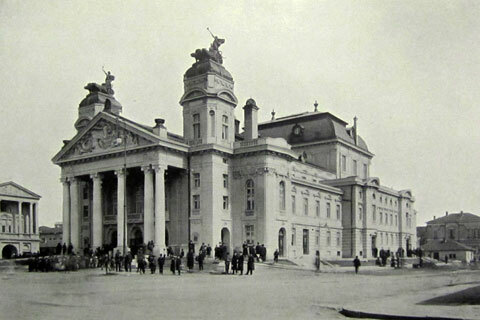 Sofia University Sveti Kliment Ohridski is the first Bulgarian school of higher education. Evlogi and Hristo Georgiev, its original and largest donors, sit out front. Eagle Bridge (Bulgarian: Orlov Most) was built over the Perlovska River in 1891. Its name comes from the four bronze eagle figures on the bridge, which are its symbolic patrons and protectors.